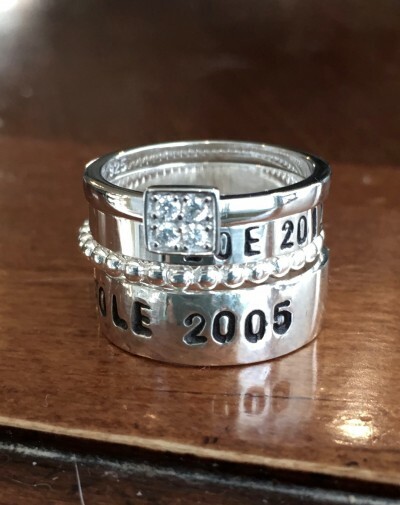 Unique stackable name ring set personalized with family names, date and meaningful message- customize a Mother’s Ring to celebrate an anniversary or new baby. Sterling silver, hand stamped stacking ring set– four rings. 4mm band- personalize with up to 12 characters. 6mm band-personalize with up to 30 characters. 1.5mm Square CZ stacking ring. Sizes: 6, 7, 8 or 9. 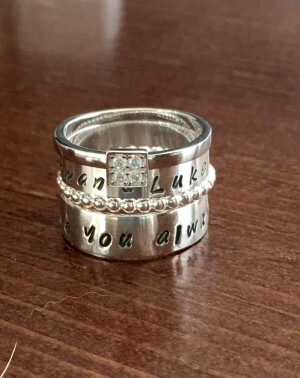 Categories: Collections, Gifts, Hand Stamped Rings, Rings, Stackable Rings. Tags: anniversary ring, hand stamped ring, mothers ring, name ring, stackable ring, sterling silver.